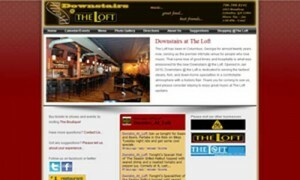 In 2010 Visionquest produced three sites for The Loft, a three story building with a restaurant downstairs, a bar and venue upstairs, and a recording studio and offices on the top floor. The Downstairs at The Loft site was created for the restaurant that existed on the ground floor of The Loft, and a small site was created for the studio as well. This site was created to show the brand as a whole and to link to the smaller sites. I also created a logo for them which is engraved on the front door.